I hope all our members and associates have had an incredible start to 2018! At DCRC, we are working hard to make sure that the meeting and events scheduled for this year are up to the standards expected from this organization. I’d like to remind you of the incredible database of materials at disposal to our members: presentations and papers from all previous annual meetings, protocol charts (also in Spanish) and past webinars (also held in Spanish and Portuguese). In addition, research summaries, featured columns and “ask the expert” sections provide updated information on hot topics involving dairy cattle reproduction. We have an important update regarding the upcoming annual meeting. It will be held at The Westin Indianapolis, Nov. 14-16. Unfortunately, due to previous contractual obligations, the 2018 meeting goes back to the Wednesday to Friday format. But since we received incredibly positive feedback on the Tuesday to Thursday format held in Reno, Nev., last year, we will go back to the Tuesday through Thursday format in 2019 and beyond. The DCRC board of directors apologizes for this scheduling confusion, but these contractual decisions are made years in advance in most cases. One of the most exciting events at every annual meeting is the DCRC Herd Reproduction Awards. DCRC tries to recognize outstanding reproductive performance from herds around the world. In previous years, the participation of veterinarians, extension agents, AI and pharmaceutical company representatives, and consultants has been tremendous! So, let’s continue this great tradition and nominate even more herds for 2018. The window for nominations will run from March 1 (just a few weeks away) to April 30. Details can be found at dcrcouncil.org/awards. The program committee is now finalizing the 2018 annual meeting program. As usual, we expect a continuation of great topics and speakers. The committee carefully reviewed all comments and suggestions given by members during the 2017 annual meeting and is incorporating topics that are currently on DCRC members’ minds. Program details and topics will appear in the April DCRC newsletter, so stay tuned. DCRC will continue to build on the excellent improvements from previous years, including more webinars, new website interface and more activities through social media. We are now working to add new technical and educational materials. Also, we hope to update members on extra initiatives to improve membership and meeting attendance. Lastly, we are currently working toward a new strategic plan for DCRC that will guide us into the future. Don’t hesitate to reach out to DCRC leaders and staff if you have questions, suggestions or would like to volunteer your time or resources to DCRC. And if you’re interested in being a corporate sponsor of DCRC, please let us know. Keep up to date on DCRC programs and resources by visiting www.dcrcouncil.org. Help us spread the “good news” about DCRC through social media: follow us on Twitter (@DCRCouncil) and Facebook. Your retweets and “likes” help extend the reach of DCRC’s information and programs. The authors investigated a second PGF2α treatment or a double dose of PGF2α during a Resynch protocol on luteal regression and pregnancies per artificial insemination (P/AI) in lactating dairy cows. The results are in press in the Journal of Dairy Science. Authors revealed that at 39 d after TAI, cows receiving two doses PGF2α tended to have more pregnancy per P/AI than control cows (35% vs. 31%), whereas cows receiving double dose of PGF2α were similar to control cows. Pregnancy loss from 38 to 66 d did not differ among treatments and was 8%. Moreover, authors reported that the percentage of cows with complete luteal regression (P4 <0.4 ng/mL at G2) tended to be greater for GPPG cows than for GDDP and control cows (94% vs. 88% vs. 88%, respectively). Additionally, authors showed that cows with P4 <1 ng/mL at the first PGF2α treatment had fewer P/AI than cows with P4 ≥1 ng/mL (27% vs. 38%), whereas cows with P4 ≥0.4 ng/mL at G2 had fewer P/AI than cows with P4 <0.4 ng/mL (15% vs. 38%). Additionally, Ca was not associated with the amount of milk produced within the first 9 DHIA tests in primiparous cows; however, multiparous cows with Ca ≤1.95 mmol/L produced, on average, 1.1 kg more milk per day across the 9 DHIA tests than their multiparous counterparts with Ca >1.95 mmol/L. In conclusion, authors indicated that adding a second PGF2α treatment 24 h after the first within a Resynch protocol tended to increase the proportion of cows having complete luteal regression and P/AI, whereas treatment with a double dose of PGF2α at a single time did not. Researchers investigated the effects of feeding diets with distinct dietary cation anion difference (DCAD) levels supplemented with 2 sources of vitamin D to test the hypotheses that feeding acidogenic diets prepartum reduce the risk of hypocalcemia and other diseases, and improve reproductive performance. Authors also surmised that the benefits of a negative DCAD treatment on health would be potentiated by supplementing calcidiol when compared with cholecalciferol. The results are in press in the Journal of Dairy Science. These treatments were fed from day 252 of gestation until calving, thereafter cows were fed the same lactation diet supplemented with cholecalciferol at 0.70 mg for every 20 kg of dry matter. Authors revealed that feeding a diet with negative DCAD eliminated clinical hypocalcemia (23.1% vs. 0%) and drastically reduced the incidence and daily risk of subclinical hypocalcemia observed in the first 48 to 72 h after calving. Authors also reported that the diet with negative DCAD tended to improve neutrophil function in all prepartum cows and improved neutrophil function in prepartum and postpartum in cows. Authors showed that feeding calcidiol improved neutrophil function and reduced incidence of retained placenta (30.8% vs. 2.5%) and metritis (46.2% vs. 23.1%). Also, authors reported that combining the negative DCAD diet with calcidiol reduced morbidity at least 60% compared with any of the other treatments. Cows with morbidity had lower blood ionized Ca and serum total Ca concentrations than healthy cows. Treatments did not affect the daily risk of hyperketonemia in the first 30 d of lactation. Despite the changes in cow health, manipulating the prepartum DCAD did not influence reproduction. However, feeding calcidiol tended to increase the pregnancy rate 55%, which reduced the median days open by 19. Researchers concluded that feeding prepartum cows with a diet containing a negative DCAD combined with 3 mg of calcidiol was the most effective strategy to benefit health in early lactation and potentially improve reproduction. They indicated that studies with more cows might be necessary to confirm the tendency of improving fertility. A resynchronization of ovulation program based on ovarian structures present at nonpregnancy diagnosis reduced time to pregnancy in lactating dairy cows. 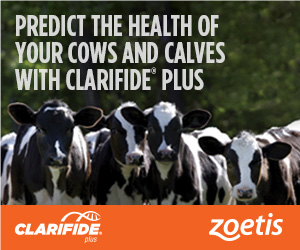 The rate at which cows get pregnant is one of the main drivers of profitability on a dairy. Despite progress on first-service pregnancy per AI (P/AI) due to improved dairy herd management, the reduction of the interbreeding interval reinsemination remains a challenge. Cows in SR with a corpus luteum (CL) and a follicle >10 mm received PGF2α, PGF2α 24 h later, GnRH 32 h later, and TAI 16 to 18 h later. Cows in SR without a CL received a modified Ovsynch protocol, consisting of GnRH plus CIDR, PGF2α and CIDR removal 7d later, PGF2α 24 h later, GnRH 32 h later, and TAI 16 to 18 h later. Treatment did not affect overall P/AI. However, for cows with no CL at NPD, there was an increased P/AI for cows in the SR treatment compared with cows in the R32 treatment. The hazard of pregnancy was greater for the SR treatment, with a lower median time to pregnancy for the SR treatments (79 d) compared to R32 (95 d). The SR treatment had a reduced proportion of nonpregnant cows 210 d after first service compared with R32 treatment. The SR program could reduce time to pregnancy due to decreasing the interbreeding interval for cows with a CL at NPD and greater P/AI in cows with no CL at NPD. Reproduction and mastitis rank as some of the top issues dairy producers face when striving to foster animal health and manage profitable and sustainable dairy operations. Groups like Dairy Cattle Reproduction Council (DCRC) and National Mastitis Council (NMC) have addressed these challenges and have helped producers make significant strides in improving animal health, reproductive performance and milk quality. At the 2017 DCRC Annual Meeting, Pam Ruegg, formerly with the University of Wisconsin and now serving as the animal science department chair at Michigan State University, and a past NMC president, addressed mastitis and its impact on fertility. Ruegg shared four key reproduction-mastitis tenets. First, intramammary infections (IMI) caused by different types of bacteria (Gram-positive and Gram-negative) stimulate the cow’s immune system and these immune responses can result in reduced reproductive performance. Second, the interval beginning immediately before breeding and continuing until confirmation of pregnancy is a critical period. Mastitis occurring during this time can result in significantly reduced breeding performance. Third, preventing mastitis is based on understanding the etiology and sources of IMI. Dairy producers should culture cases of mastitis and identify sources of initial exposures. And fourth, minimizing mastitis is an important step in improving fertility. Producers should apply best management practices to ensure hygienic milking, cow comfort and management of high-risk (mastitis) cows during transition and early lactation. Managing mastitis requires using accurate detection and recording systems – for both subclinical and clinical cases. Monthly somatic cell count (SCC) testing is the most common method for detecting subclinical mastitis. “Without routine SCC testing of individual cows, effective management strategies for controlling subclinical mastitis are extremely limited,” said Ruegg. Forestripping finds clinical mastitis. Thus, removing foremilk prior to attaching the milking unit is a key step to identify cows with clinical mastitis. On most modern dairy farms, subclinical mastitis is primarily caused by Gram-positive organisms (such as environmental Streptococci or Coagulase-negative staphylococci [CNS]), whereas the greatest proportion of milk samples from clinical cases are culture-negative or Gram-negative. When results of milk cultures are closely linked to treatment decisions, the value of culturing milk from cows with clinical mastitis is evident. This strategy supports effective and judicious use of antimicrobials. Knowledge of etiology clarifies the potential impact of mastitis on reproductive performance. Why? Stimulation of inflammation varies among pathogens. Gram-positive and Gram-negative bacteria have different cell wall components that activate the immune response after an IMI. The lipopolysaccharide component of Gram-negative bacteria stimulates the release of pro-inflammatory mediators that are thought to induce increased PGF2α, resulting in luteolysis. Ultimately, this triggers myometrial contractions and reduces fertilization and embryonic survival. Gram-positive bacteria contain peptidoglycan that may trigger a pyretic reaction – similar to responses elicited by endotoxins. It is believed that inflammatory responses to both Gram-positive and Gran-negative bacteria can be associated with embryonic losses through inflammatory products and increased body temperature (fever). Numerous studies associate mastitis with reduced reproductive performance, including reductions in frequency of natural estrus (Moore et al., 1991, Barker et al., 1998; Schrick et al., 2001; Santos et al., 2004), reduced conception rates (Barker et al., 1998; Schrick et al., 2001; Chebel et al., 2004; Santos et al., 2004; Ahmadzadeh et al., 2009), and increased pregnancy loss (Hudson et al., 2012). The period when mastitis occurs is important relative to fertility (Barker et al., 1998; Schrick et al., 2001; Santos et al., 2004; Hertl et al., 2010; Hudson et al., 2012). “The most critical period is immediately before and after breeding,” said Ruegg. Both subclinical mastitis (Schrick et al., 2001; Lavon et al., 2011a; Lavon et al., 2011b; Hudson et al., 2012; Fuenzalida et al., 2015) and clinical mastitis (Moore et al., 1991; Santos et al., 2004) have been associated with reduced reproductive performance. Schrick et al. (2001) found that cows that experienced either subclinical or clinical mastitis before breeding had increased days to first service, days open and services per conception, compared with healthy cows. The mastitis severity level correlated with reproduction success. As mastitis symptoms progressed from subclinical to clinical, during the interval between first insemination and pregnancy examination, fertility diminished (Schrick et al., 2001). Similarly, increased SCC before or after artificial insemination (AI) strongly correlates with decreased reproductive performance. The effect increases as SCC rises (Lavon et al., 2011a; Hudson et al., 2012). Furthermore, they found that a single SCC >1,000,000 cells/mL event during the 10-day period before AI resulted in significantly decreased probability of conception. For cows affected by subclinical mastitis, Hudson et al. (2012) observed that the probability of AI leading to pregnancy decreased 18 percent for cows with SCC between 200,000 and 399,000 cells/mL (from 1 to 30 days post AI), whereas the probability decreased almost 26 percent when SCC exceeded 399,000 cells/mL. “The Fuenzalida et al. (2015) study further reinforces the detrimental role of inflammation on reproductive performance,” said Ruegg. “Reduced exposure to mastitis pathogens combined with management strategies that result in optimal immune function to cure IMI when they occur are critical for ensuring successful breeding programs. Brent Cousin works for Holsum Dairies LLC in northeast Wisconsin as a dairy manager for one of the dairy sites where they milk 4,400 dairy cows and raise 2,000 calves, ranging in age from 1 day to 7 months old. They milk an additional 4,000 cows at a second farm nearby. Cousin grew up on a small dairy farm in southern Wisconsin and attended veterinary school at the University of Wisconsin-Madison, with the intent of becoming a dairy cattle veterinarian. Prior to joining the Holsum Dairies team, Cousin spent 10 years as a practicing veterinarian in northeast Wisconsin and then worked as a professional service veterinarian for a pharmaceutical company in the Upper Midwest. Today, Cousin does veterinary work and manages the day-to-day operations of employees and facilities. “This varied background has afforded me the opportunity to experience the dairy industry from multiple sectors and has helped me cultivate a unique perspective of our industry,” he said. Cousin first learned about DCRC from one of his clients. The dairy producer received a DCRC Herd Reproduction Award for reproductive efficiency. Since then, Cousin has served on several DCRC committees. How does DCRC influence dairy reproduction education and improvement? According to Cousin, as an organization that includes dairy producers, veterinarians, academic scientists and professionals from allied industries, DCRC bridges the gaps among many sectors of the dairy industry. “By bringing together leaders from multiple sectors with the common goal of improving dairy cattle reproduction, DCRC serves not only as a reliable source of the most current research but also as a resource to help implement new ideas,” he said. He added, “The dairy industry is continually changing and one of the biggest challenges we face is continuing to evolve our reproductive programs to fit the changing industry.” Tapping into resources and DCRC “colleagues” helps Cousin delve into dairy management challenges.